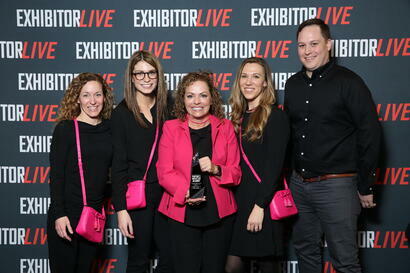 Mirror Show Management (MSM) was recognized by EXHIBITOR MAGAZINE with three industry honors at the EXHIBITORLIVE awards ceremony held on February 27th. (Rochester, NY) (March, 2019) – Mirror Show Management (MSM) was recognized by EXHIBITOR MAGAZINE with three industry honors at the EXHIBITORLIVE awards ceremony held on February 27th. The first was recognition in EXHIBITOR MAGAZINE’S Portable Modular Awards program, for the exhibit design created for Cisco Systems. Cisco desired a tech-forward, modern and eye-catching set of exhibit properties to up-level their presence at mid-size trade shows. The set of properties also needed to include flexible demo stations and thematic elements that could be reconfigured for all business units. The resulting design that debuted at RSA 2018 won in the Best Reconfigurable Exhibit category. 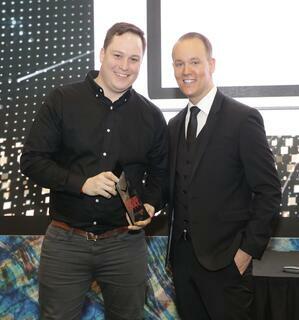 A second win was a Buyers Choice Award for the newly launched MapBuilder by ExperiDigital®. This smart event mapping tool was selected as one of 32 featured products in EXHIBITORLIVE’s New Product Showcase (NPS) program, a program that highlights the hottest new products and services making their debut at the annual industry event. NPS products were judged by a panel of event marketing profe ssionals and MapBuilder was one of six products that received a coveted Buyers Choice Award. 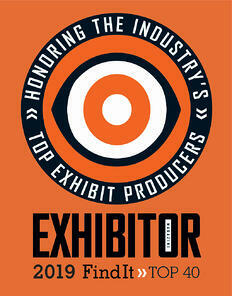 Finally, MSM was honored with placement on EXHIBITOR MAGAZINE’S 2nd annual Find It–Top 40 list. This program is intended to spotlight the best exhibit producers in the industry, while also providing a valuable resource for exhibit managers searching for new potential partners," said Randy Acker, president and chief operating officer of Exhibitor Media Group. The list represents the elite U.S. and Canadian exhibit providers in the industry and provides buyers seeking a new trade show partner assurance that they’ve met this industry authority’s “seal of approval”. While over 100 companies applied, only 40 made the cut. View the official Press Release for Buyers Choice Awards here. View the official Press Release for EXHIBITOR MAGAZINE’S Find It Top 40 here. Mirror Show Management (MSM) is a woman-owned customer experience agency specializing in exhibits, events and environments. Our specialty is delivering custom brand experiences that engage, inspire and educate to drive customer loyalty. MSM was the first agency RFP-certified by the Experiential Designers and Producers Association, was named a Top 5 exhibit producer on Exhibitor Magazine’s Find It-Top 40 list, resides on Event Marketer’s Fab 50 List of elite exhibit fabrication companies and has been named a Top Workplace each year since the award’s inception.